It's October so let's get ready for Halloween! For families who choose not to participate in Halloween, this craft can still be useful, simply leave out the red fangs and change the color scheme. 1. Gather your materials. 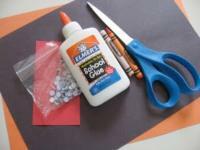 You will need black, red, and orange construction paper, glue, crayons, scissors, and googly eyes. 2. 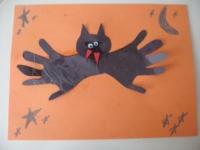 Start by having children draw a bunch of fun night-time things on the orange paper. Stars, a moon, even an owl would be great! Help children if they are young or skip this step like we did. I added the stars and moon after we were done, just for y'all. 3. 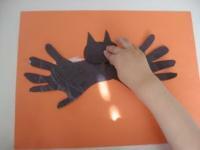 Trace children's hands on black paper. 4. 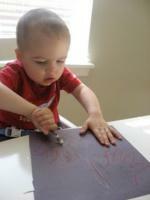 Have children color the hands with a white crayon. 5. While they are coloring draw a bat head. Don't worry about making mistakes. We'll use the opposite side. Cut out small red fangs. 6. Cut the other pieces out. 7. 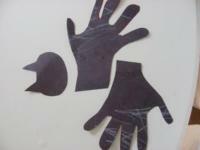 Put two globs of glue on your orange paper for the hands. 8. Pop the hands on. Don't worry about which sides are up (one of ours is upside down), but make sure they meet in the middle. 10. Glue on the fangs. 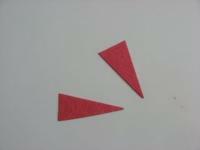 I usually add the glue, then help direct children where to put them, saying things like, "Can you point the triangle down?" However, it is unnecessary to be concerned with how it "looks". A good tip is to talk about what you are adding. You could say, "Fangs are big teeth," or "Where should the bat's teeth go?" 11. Add the eyes! 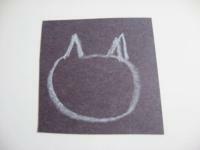 If children are still eating things, you can draw eyes on with a white crayon instead.